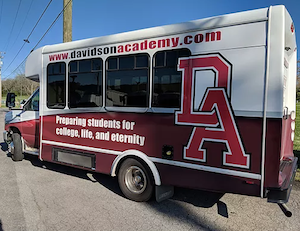 Davidson Academy provides bus transportation to and from school for students K5-12 along certain routes. Our primary commitment is student safety. For a ride home from school, students will simply board the bus and give the driver their name and stop, and the charge will be posted to their school account. To indicate your interest, email Levoy Elmore at lelmore@davidsonacademy.com. Parents are asked to be respectful of schedules for both drop-off and pick-up times. Once a bus leaves a stop, the driver is not allowed to stop again until the next official stop. In the afternoons, drivers are instructed to wait five minutes at each drop-off. Any student left on a bus after the last stop will be transported back to school. Drivers make every effort to contact the parent through available numbers. Each bus is maintained by certified mechanics in accordance with Department of Transportation guidelines.